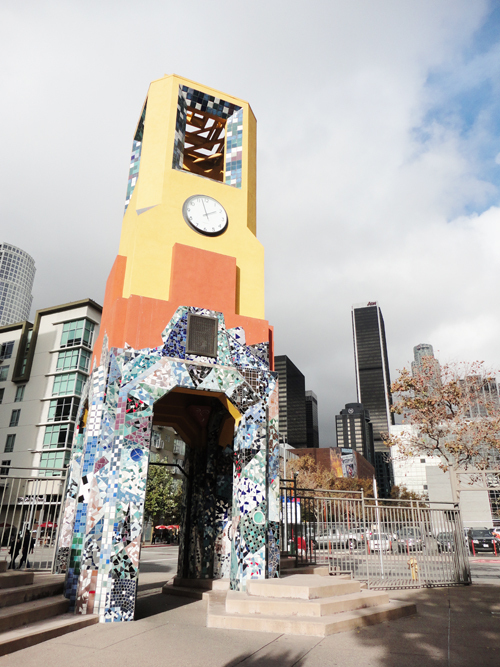 On Saturday morning my husband Luke and I drove three hours south to Downtown Los Angeles. We listened to Murder City Devils, Magazine Dirty, and The Bronx the whole drive, so by the time I got out of the car I was pumped up and ready for some fabric shopping! At 2:00 I met Christine Haynes at the FIDM campus. I have to admit, I was nervous about meeting her. She is someone that I look up to so much and I was worried that I would be a total dork and embarrass myself. Would I get nervous and blabber too much and then sweat excessively when I realized how lame I was being? Would she be bummed that she was stuck shopping with someone so uncool? Haha these are the things that go through my head! Amazingly I was able to keep my mouth shut about my dress. 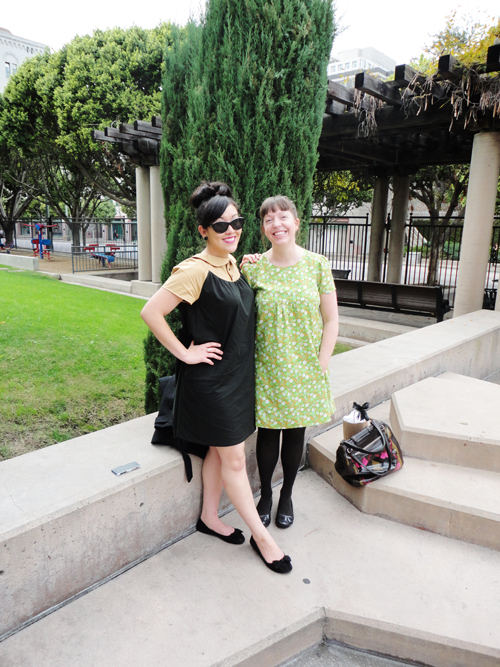 I wanted to surprise Christine by making one of her patterns, the Chelsea dress. I was super excited about wearing it to meet her and I think she was surprised! 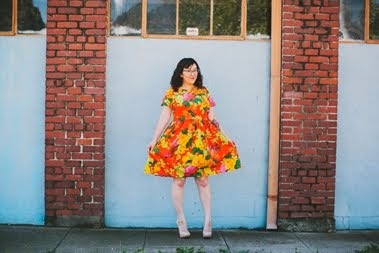 Oh, it was cool, when I was walking to meet Christine a random lady on the street stopped me and told me she loved my dress :) I'd also like to add that this is the most comfortable dress ever and the fact that it was so comfortable during a three hour car ride made it ever more awesome. 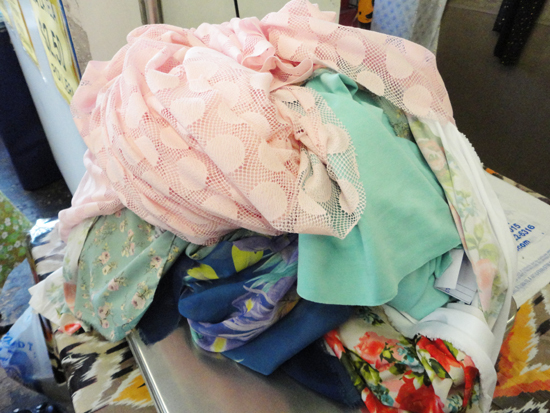 We went to the Michael Levine loft and scored with some rad fabric. 5.9 pounds of fabric at $2.50 a pound = $16.04 including tax. Nothing wrong with that! Our next stop was to Islands Fabric, a store that specializes in Hawaiian fabric. Surprisingly, I didn't buy anything Hawaiian, I bought LA Lakers fabric. No, this is not a joke, I seriously bought Lakers fabric. It's for gifts though!! After Islands Fabric, Christine and I parted ways. I had SUCH a blast with her and made her promise to call me when she comes up north. I am happy that I can call Christine my friend, she is one of the most amazing people I know. 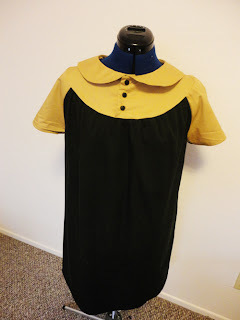 Here are a couple closeups of the dress I made. I can't recommend this dress enough! 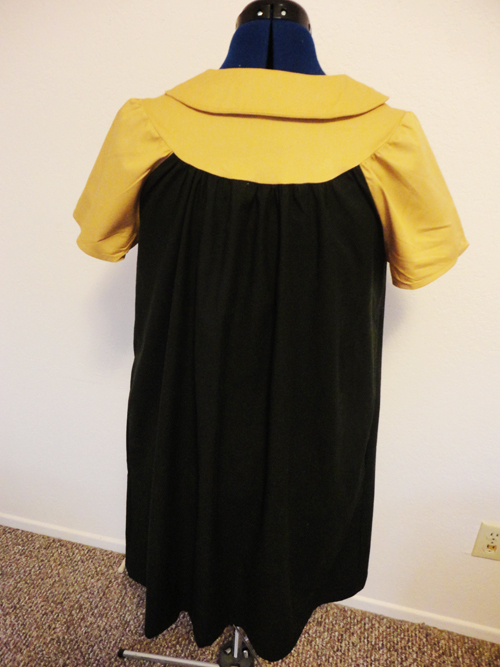 The directions are so straightforward, it was easy to sew, and it's soooo comfy! I love how the look is so different from my muslin due to the different fabric. I used shirting from Mood and it feels so soft against my skin, it's amazing how much of a difference nice fabric can make! What an amazing day!!! I can't believe you bought Lakers fabric! Even for gifts...LOL! What a cute dress! 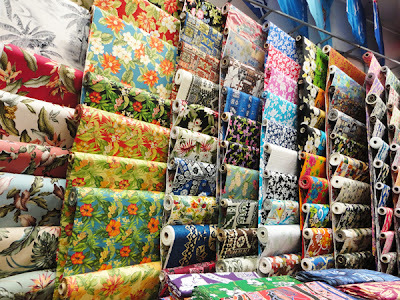 I LOOOOOOOVE all that Hawaiian fabric-- so fun! Oh. Oh. Oh. Island fabric by the bucket load. Wow. It's great you got to meet Christina. How exciting!!! That dress is super cute! I understand your nervous feelings before you met Christine. I felt the same way when I met up with Marci (Oonaballoona), CHristine (Daughter Fish), and Nette (Sown Brooklyn). 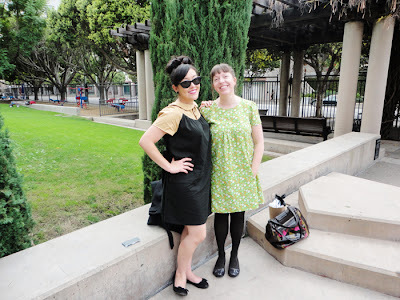 Isn't it funny how well seamstresses/bloggers get along? You guys look so cute in your dresses!